The Nolan Company’s Bank Performance Study analyzes the business of banking, how things have changed over the past years and what changes may be looming on the horizon. As the results of the latest study are compiled, some compelling trends are emerging from the raw numbers. One of the key steps in compiling the study results is to align the results from the current year with the two prior years to identify trends. 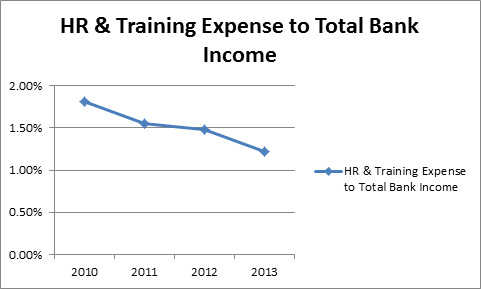 In examining trends in the Benchmarks (top-quartile performers) and Averages of participating banks, we saw a clear trend of declining Human Resources and Training Expense as a percentage of Total Bank Income over the last four years. This trend may not seem particularly alarming by itself, but it is an area that is interesting to investigate. Technology is rapidly changing how organizations do business, and its impact on banking is only becoming more pronounced. As discussed in a recent Nolan newsletter article, one of the key trends in banking in recent years is the steady decline of branch transaction levels, driven by customers taking advantage of new technologies like online banking. Fewer branch transactions means fewer people required to process them. Some banks have recognized this and begun to reduce branch staffing levels. Additionally, the relatively stagnant economy has resulted in lower staff turnover and reduced recruiting, hiring and training activity – traditional core Human Resources functions. As a result, Human Resources departments in banking have generally downsized. This presents an interesting challenge to Human Resources directors. There are risks in going too far with expense reduction, just as there are risks in not going far enough. An HR staff that is too thin can’t respond effectively and efficiently to economic and seasonal trends, and a staff with significant excess capacity carries too much cost and may tend to take on non-core tasks. Functions performed in bank Human Resources departments can vary significantly and there is always an opportunity to do more, but within budget limits. The trick is to determine which functions have the potential to provide the most value for the organization at a given point in time, to focus on them, and still be able to adjust that focus and priorities as business conditions change. Nolan used a hybrid Activity-Based Management / Value Analysis approach designed to streamline existing processes and also evaluated the current HR functions being performed in terms of the value they brought to the organization. A cross-functional workshop team was facilitated through a process which identified several improvement opportunities within the core functions such as recruiting, hiring, approvals, and payroll. Several technology improvement and non-personnel expense reduction opportunities were also identified. The degree to which the function had the potential to positively impact the bank’s overall efficiency ratio (e.g. ; reduce expenses or increase revenues). The perceived performance and value of the function from the perspective of internal customers. With the employee survey as a base, functions were evaluated based on their “importance” and “performance” scores. Functions viewed as being highly important but not performing optimally were targeted for improvement and then increased emphasis. Functions with low importance and low performance were targeted for significant reduction or elimination. Little or no time was being spent on talent management, yet there was a significant opportunity to directly impact the bank’s efficiency ratio with stronger emphasis in this critical area. There was significant opportunity to streamline the highly paper-intensive environment, including simplifying or eliminating forms, approvals and policies. Opportunities were identified for training staff to provide value with further cross-training of contact center staff so that they could focus additional effort on improving customer retention rates by broadening customer relationships. Significant administrative expense reductions were identified, which were then used to help fund the acquisition of badly needed software. There was an opportunity to better align incentive plans with corporate goals and strategies and more effectively drive revenue enhancement and expense reduction. In summary, this highly successful engagement resulted in important core processes being streamlined, low value functions being reduced or eliminated, streamlined and emphasized high-value functions, and reduced overall expense. The process provided the HR team with a new perspective and strategic direction that was better aligned with the organization’s goals. With so much pressure to reduce expenses, it is critically important for Human Resources directors to be aware of the value their functions bring to the organization relative to the investment being made. If this awareness does not exist, there is a risk of spending too much time and energy on functions that don’t provide value. If you would like additional information on Nolan’s Bank Performance Study or would like information on the case study cited above, or our work with HR departments in banks, please contact me at mike_meyer@renolan.com and visit our website at www.renolan.com.